Let me start by saying disc brakes are awesome, they provide great stopping power, modulation, don't wear out the rims and still make it easy to remove the wheel from the frame. 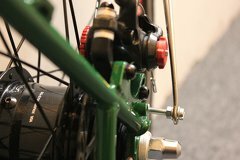 Originally intended for off road use the technology has matured so much that they are now starting to find their way in cyclocross and touring bicycles. When looking to buy a new bike I started out thinking that some kind of rim brake would be sufficient, but after doing some research I became convinced that disc brakes are the way of the future and chose a frame with disc brake mounts. My intention is to use the bike in the city, and camping trips. Because I live in The Netherlands where the only thing predictable about the weather is that it will change; mudguards are a must have. I am well aware that mudguards add weight, make the bicycle less aerodynamic and most importantly make a bicycle look a little bit more dorky, but getting sprayed with cold dirty rainwater gets old real fast, so I am happy to pay the toll for a decent set of mudguards. The bicycle frame I chose was selected especially for the ability to mount disc brakes, mudguards, racks, bottles, and anything else you might want to bring on a multi day trip. I have 28" wheels (622 mm rims) with 2" (50mm) Schwalbe Big Apple tires. There was only one set mudguards wide enough: the SKS Bluemels 65 mm. Although they have the right size there is no way the mudguards would fit. 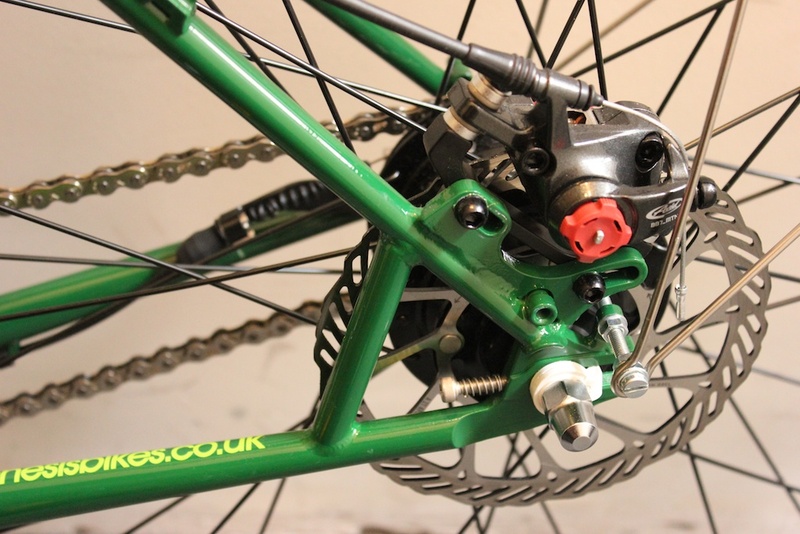 In both the front and rear the disc brakes block the stays that keep the mudguards in place. The manual that came with the mudguards was already sparse on details, and does not cover this situation, the amount of extra screws supplied is minimal. Bending is not an option, they are simply not long enough. My next idea was to mount them in another way, attaching them to another bolt on place, and cutting of the excess of the sticks. Besides this looking even dorkier, and making the whole thing flimsier the sticks also turned out to be quite hard to cut or even saw. Since I am not the first person with this problem I looked online, but my search did not give me many satisfactory results. The most common solution is to use mud guards that clip on the frame somewhere else with tie wraps or clamping mechanism. These are mostly meant for temporary installation on mountain bikes, don't cover the whole wheel, and in my case would mean buying new fenders. 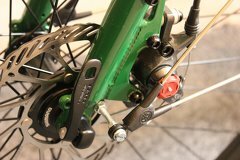 Some manufacturers of mudguards are starting to realize the issues with disc brakes and offer kits with replacement parts to make it fit. In my case that was unfortunately not the case. Time to get creative. After some measuring I concluded that I would need to mount the mudguards around 30 mm away from the frame to get enough clearance around the brakes. When they are directly on the frame it takes an M5 screw of 10 mm. 30 plus 10 equals 40, so now the challenge was to find a 40 mm M5 screw. My original idea was to keep the mudguard away from the frame by putting 30 mm of spacer tubes around the screw, however these seemed hard to find and I don't have the machinery to make them. So, on to the hardware store and see what they have there. I was looking for 40 mm M5 screw with a socket for an hex key, preferably made out of stainless steel and some spacers. While staring at all the bolts and screws it became clear that I needed to tweak my plan a little bit to fit the selection of the shop. Eventually I left the shop with a box with 8 bolts and 8 screws of 40 mm M5 with a flat head and 60 washers (rings). They are not stainless steel but zinc plated. It is always nice to have as little parts as possible on a bicycle get rusty, but we'll see how long these last. Not being stainless steel did have one advantage, they were only 1.75 euro each, so for 3.50 euro I have enough for four wheels and still have some spare parts. The flat head seemed kind of annoying, but being flat it does make the whole screw stick out a little less, and flat head screw drivers are some of the most common tools around, so I am happy with that. The rear rack that I mounted later is even wider so it acts as a guard around the screw. Before putting the thing together I made sure that the thread had a healthy amount of anti seize grease on it. Wrestling with seized rusty bolts is one of the more annoying parts of bike maintenance, so make sure you grease every thread of every screw that you come across. The same thing goes for washers; use them liberally, they do not only make it easier to unscrew things but their larger surface area prevents damaging softer materials and coatings. So I took the screw added a washer, fender mount, washer, bolt, 20 mm of nothing, bolt and finally another washer. The only thing left to do is crew it into the frame and tighten the bolt against it. 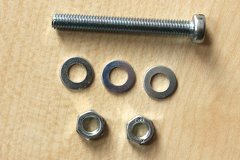 This last bolt and washer do not seem to have any function, but when the bike starts to move vibrations can cause screws to come loose, especially when there is mudguard pulling and pushing it up and down. 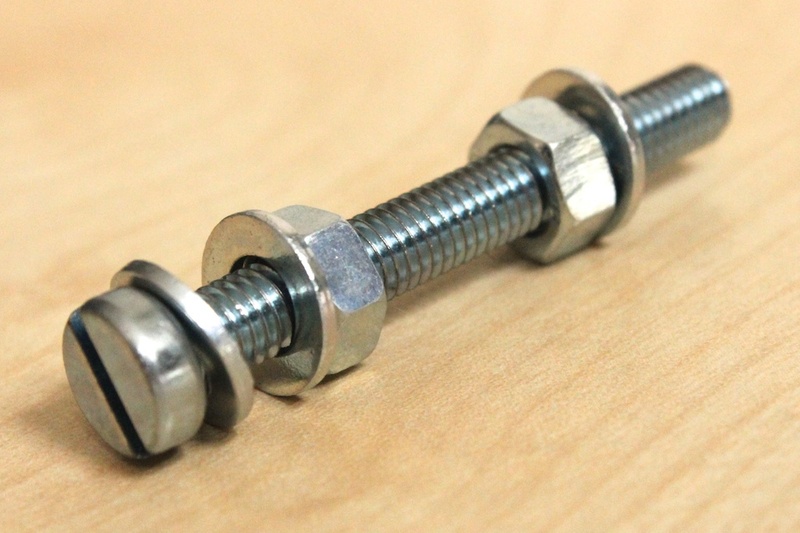 This bolts prevents the screw from turning, additionally it prevents protection. Should the screw ever bend the bolt prevents it from bending near the frame, so it will not damage the thread and can still be easily removed. So what we have is an acceptable way to mount fenders that would otherwise not fit on this bicycle with minimal costs. But the real lesson to be learned here is that when something isn't covered in the manual you can still make it work with some creativity. Just remember: stainless is painless, screwing beats clamping, always use lube, and don't forget the washers. A similar solution with bolts and spacers, which can be hard to find. M5 bolt with 3 washers and 2 nuts. The fender extender put together. 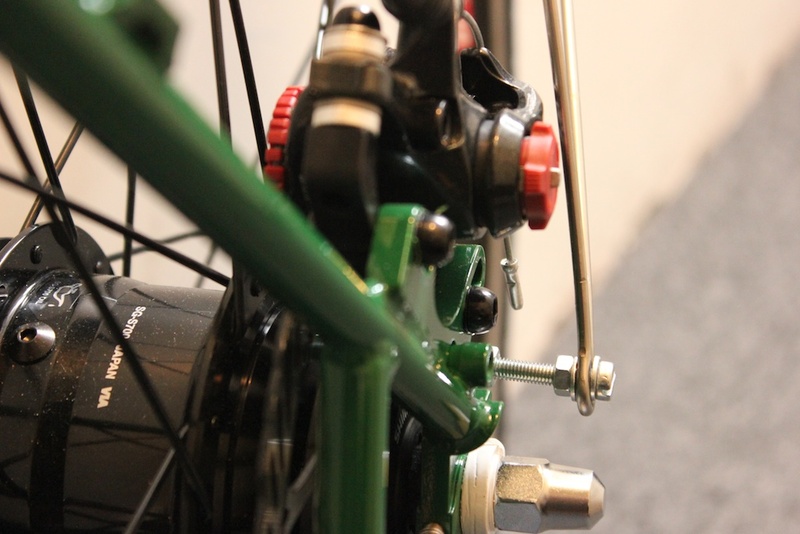 The stays now have enough clearance around the disc brake caliper on the front wheel. Also on the rear wheel the fender extender helps create enough clearance. This view shows that there is only a few millimeters clearance.